The Coastal Pacific train is a scenic train journey travelling between the delightful port of Picton - gateway to the beautiful Marlborough Sounds to Kaikoura - home of whale watching and Christchurch - the South Island’s largest city. This journey is a scenic feast, with the wine growing region of Blenheim to the rugged Kaikoura mountain ranges on one side of your train and the rugged Pacific Ocean coastline on the other. Travel through some of New Zealand’s finest horticultural and farmland areas of the Canterbury Plains, and see amazing wildlife such as dolphins, seals and penguins from the comfort of your carriage. Along the way you pass though the town of Kaikoura, where you can break your journey to take in the whale watching or dare to get closer and swim with the dolphins. The Coastal Pacific train travels through 22 tunnels and crosses 175 bridges, one of them being New Zealand’s only road-rail bridge. The Coastal Pacific carriages have advanced air bag suspension system for quieter and smoother travel, un-tinted, non-reflective, panoramic side and roof windows to capture the dramatic coastal and mountain views of the magnificent South Island, GPS triggered journey commentary in five languages at your seat via headphones, plus information displays and overhead HD video and are centrally heated/air conditioned for passenger comfort. 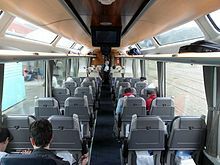 Each carriage has onboard washroom/toilet facilities, with '2 Seat-Aisle-2 Seat' forward facing seats with head rests or 'Table Group' (4 people around a table) seating allowing to experience the amazing views of the magnificent eastern side of the South Island, through panoramic side and roof windows, while enjoying the company of other passengers. The Coastal Pacific train has a café carriage offering a range of alcoholic and non-alcoholic drinks, snacks and light meals and an open air viewing carriage allows you to get even closer to the stunning scenery and provides many opportunities to photograph your favourite spots. There’s a lot to look forward to! For mobility-impaired passengers, wheelchair hoists provide access to the café carriage from track level, with spaces for wheel chair users and a disabled public toilet. For hearing-impaired passengers a hearing loop covers the whole saloon and café serving area of the carriage. The Coastal Pacific train is reserved seating 'One Class/Non Smoking' service. The Coastal Pacific train does not operate on Christmas Day - 25 December. The Coastal Pacific train timetable. Travelling on the Coastal Pacific train is a genuine kiwi rail scenic experience travelling along the South Island's north eastern region. From Christchurch you can explore the South Island's southern scenic beauty by choosing from a range of independent bus touring travel packages. The Coastal Pacific train connects with Cook Strait ferry services from Wellington to Picton and from Picton to Wellington. The Coastal Pacific train connects at Blenheim with various coach and bus services to Nelson.